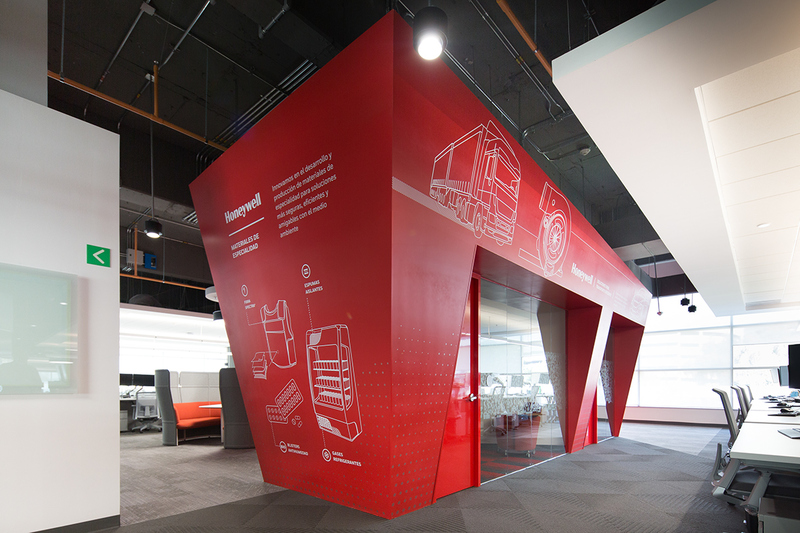 For the new offices of their Technology Solutions division in Mexico City, designed by Space Arquitectura, Cobalto Estudio was tasked with the creation of several applications to complement and enhance the space. 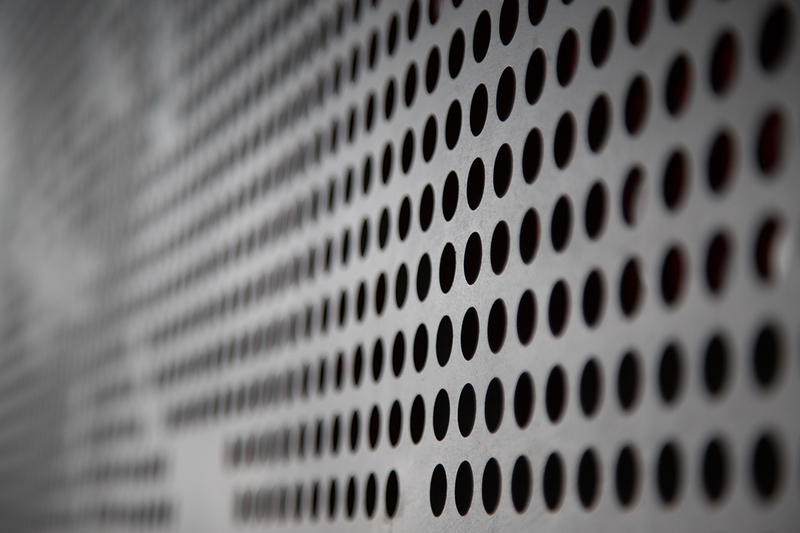 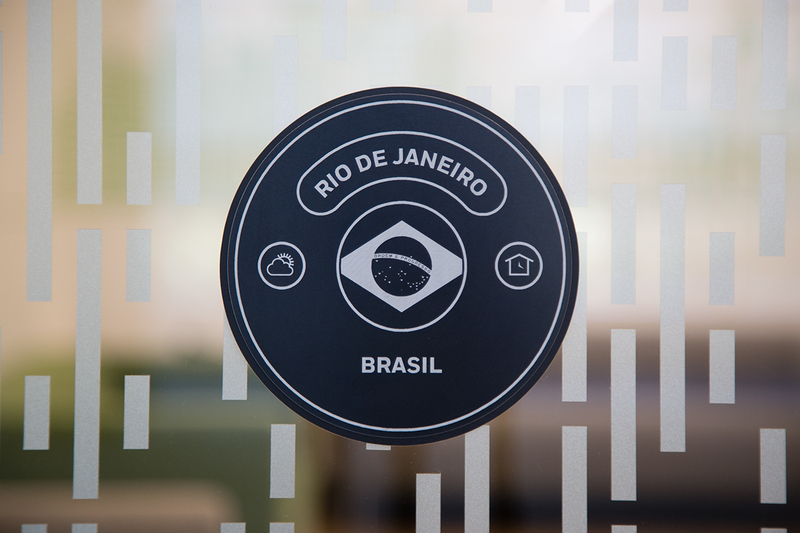 These include the sandblasted pattern on glass surfaces, signage and way-finding, graphic communication on walls, and a piece in the lobby area to communicate the countries in the world where they operate. 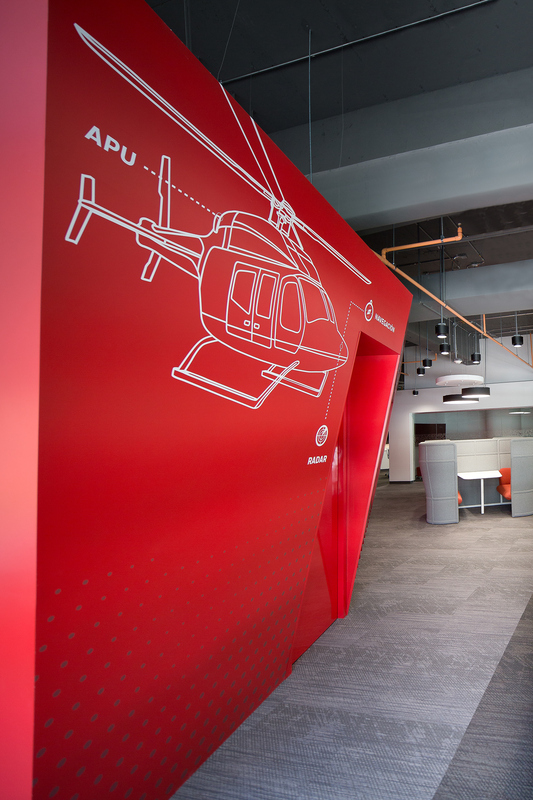 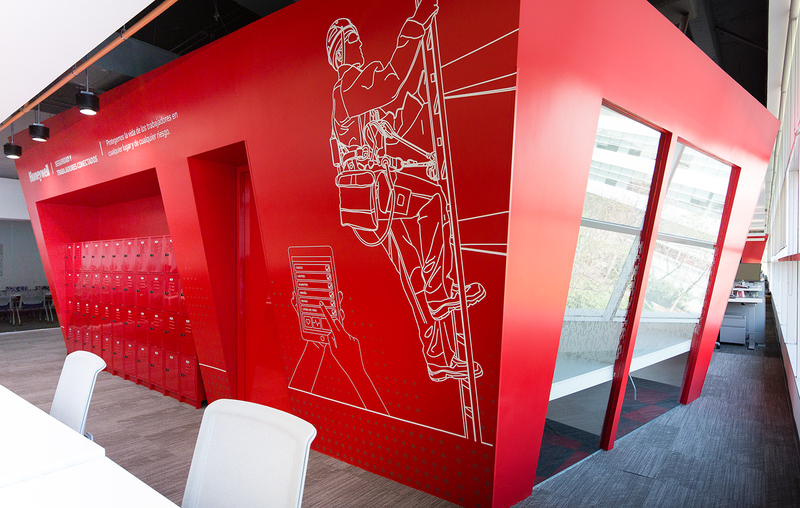 The graphics applied on the walls showcase the many applications that Honeywell’s technologies have in a wide variety of industries and scenarios, with each wall focusing on a specific business unit: Aerospace, Automotive, Safety, Fire, Retail, and Process Solutions. 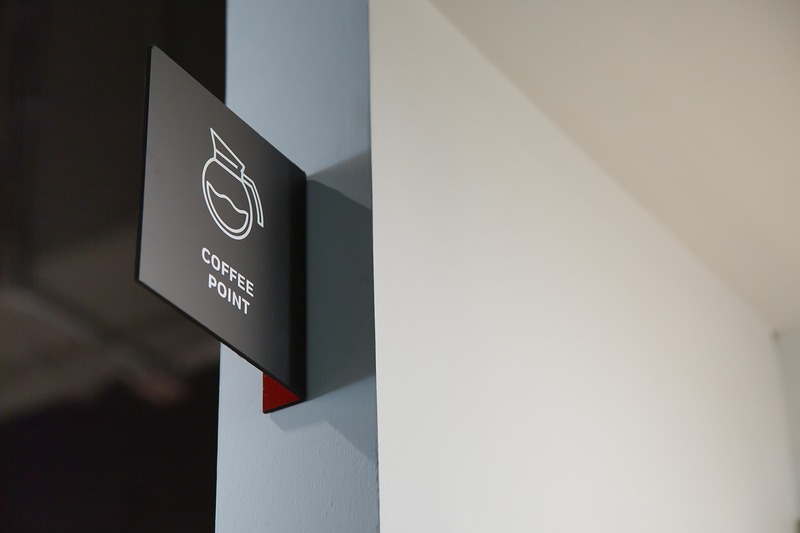 The way-finding system reinterprets Honeywell’s own Lyric Round Smart Thermostat for each of the meeting rooms, named after cities where Honeywell Technology Solutions operates. 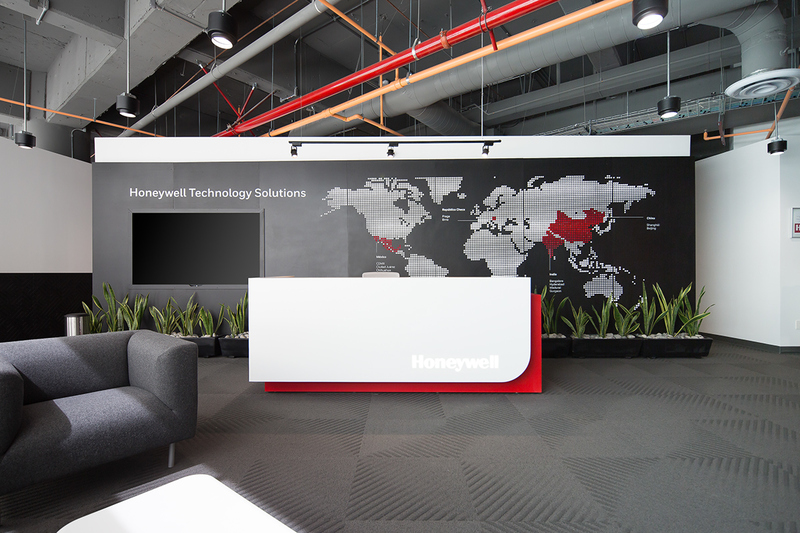 The back-lit map in the lobby area, custom built for the space, encompasses an entire wall and showcases the countries where Honeywell Technology Solutions operates with a lightbox that creates a unique experience for visitors and employees. 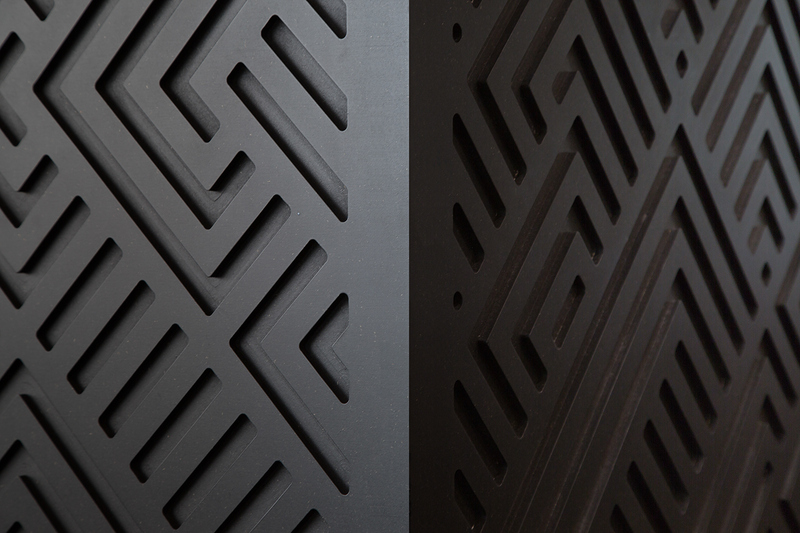 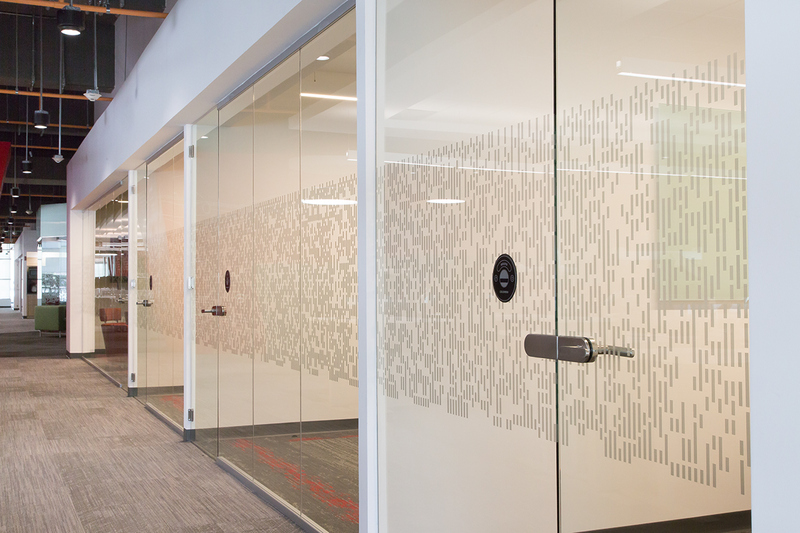 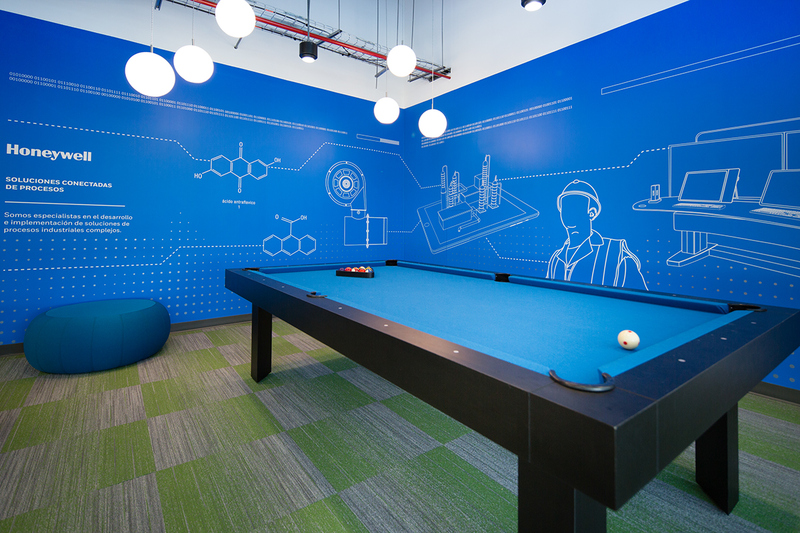 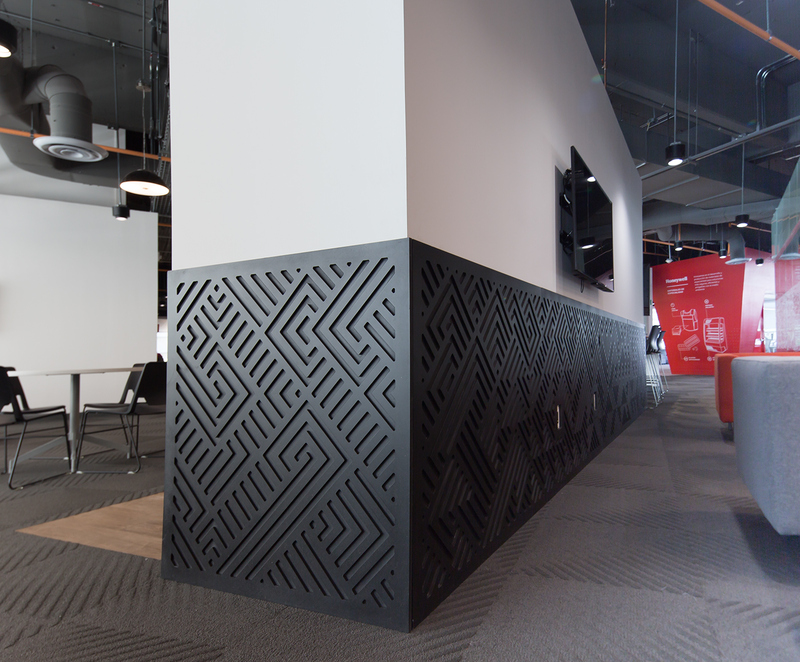 Other custom applications include a CNC-milled skirting board, sand-blasted patterns on glass surfaces, and additional signage. 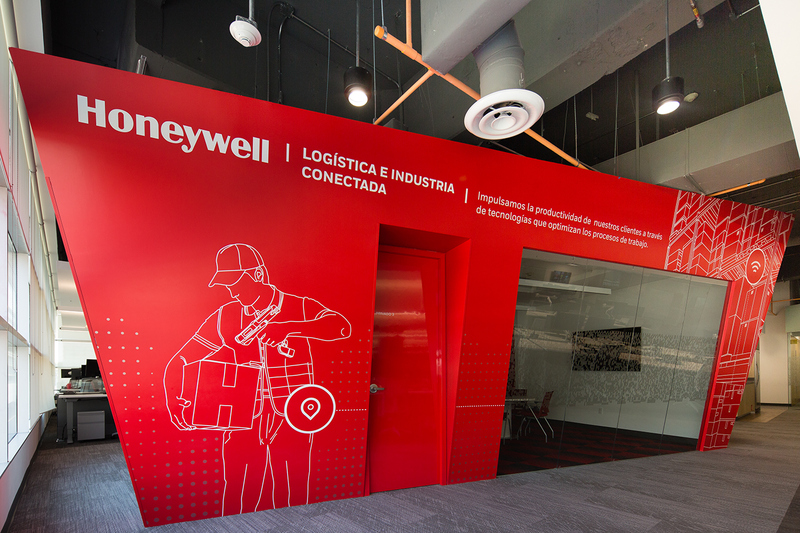 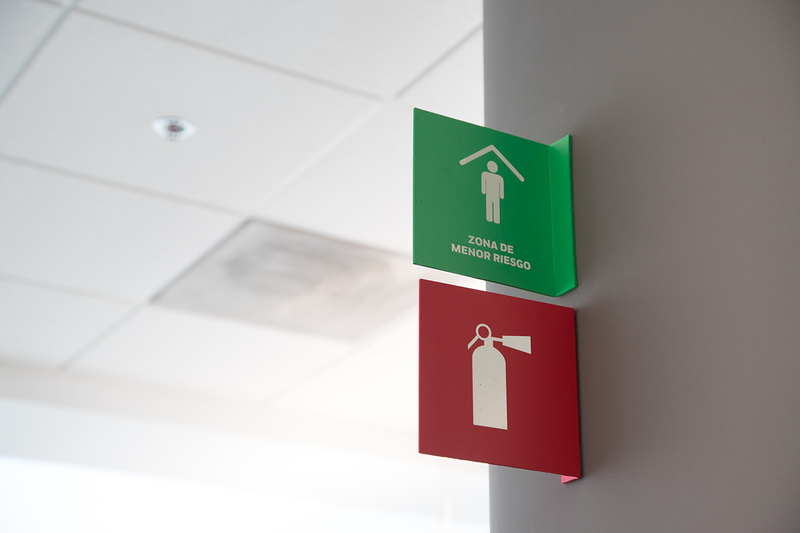 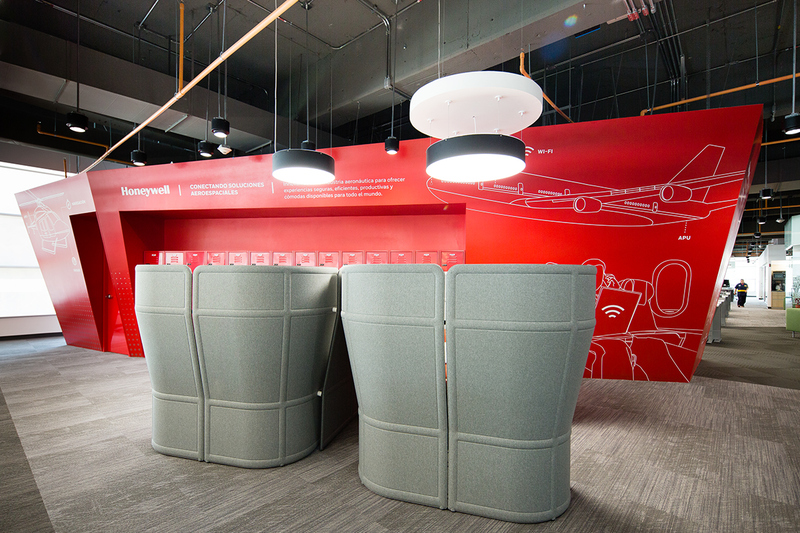 Brandscaping project for Honeywell Technology Solutions in Meexico City.